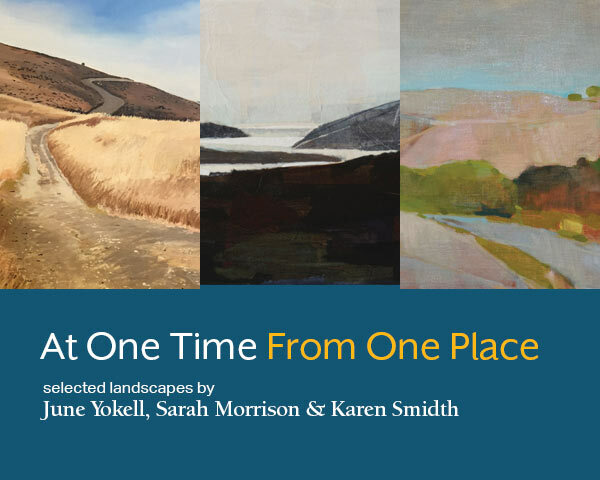 At one time, from one place celebrates the work of three artists, June Yokell, Sarah Morrison and Karen Smidth who mark the moments and the ethereal qualities of familiar locales. The artists will be donating 10% of any work sold during the exhibit to the Sierra Club. If you are interested in purchasing artwork from the show, please contact the artist directly through their websites (listed below). For as long as she can remember June has been drawn to the beauty in everyday life. Simple things, things she notices while walking or looking out a window or seeing a pattern in shadows. While it is not exactly a dream or a memory, it’s like entering another world that is right here with us always, carrying with it its sensuality and raw emotion. June is drawn to painters and writers who describe the physical as well as their psychological response to the land, those who each in his or her way describe the physical or psychological climate of place. The sources of her work are cell phone photographs taken during various walks, hikes or looking out of windows. She starts her paintings by a gesture and trys to keep the whole painting fresh from the beginning when she lays down the large planes right through to the layering of the many marks of paint that indicate plants or water or cracks in the hill. June's ultimate goal is to transfer to the viewer, her own non-verbal felt experiences. June Yokell lives and works in the East Bay and works in Marin. 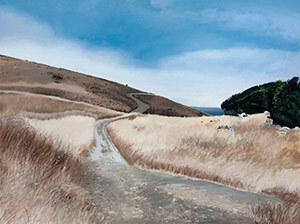 Her work is also currently being featured in a solo show at the College of Marin. For the past 20 years, Sarah Morrison has made it a practice to walk at least 2-3 miles a day, rain or shine - the more weather the better. These walks are essential to her creative process. 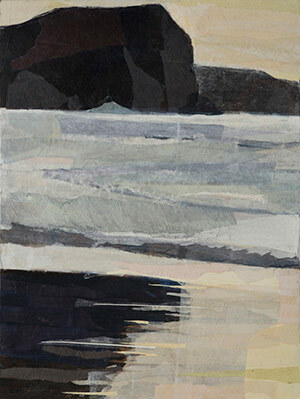 Sarah's Stinson series sprang from beach walks, most of the paintings in the series are drawn from one particular walk on a morning early in January, 2016. They’re an attempt to capture the play of light and water, the reflections and refractions of this especially crystalline morning. These "paintings" are made entirely of torn paper glued onto wooden panels with acrylic medium. Sarah's collage process evolved out of a passion for the material during her work as a printmaker. Collaging has allowed her in some sense to free the paper and to achieve the shimmering refractive qualities that originally attracted her eye in nature. 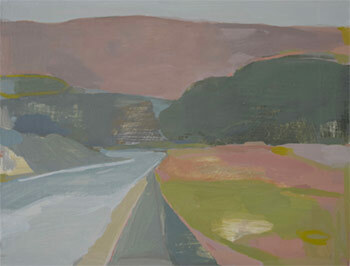 Karen Smidth's paintings are reactions to the light, color, and shapes that she sees in the landscape. She uses the landscape as a pattern or skeleton for her work in the stuido; and reflects her attempts to understand life around her. She has said that "most paintings have their ugly moments" and they need to be wiped, sanded and over painted in a process to build their character. Some paintings have strong connections to a specific moment is time, but they all relate to a place of belonging as well as allowing room for the hue of the day to shine through. Karen Smidth lives and works in Berkeley. Originally from Denmark, Karen moved to California in the mid 1980s and through her painting her "heart broke to this land."